In the years since its conception, permaculture has become a successful approach to designing sustainable systems. Its adaptability and emphasis on meeting human needs means that it can be utilized in every climatic and cultural zone. However, at the moment the large proportion of practitioners are only likely to be inspired individuals and there is a distinct lack of broadscale permaculture projects. Nevertheless, permaculture has also been used successfully as a development tool to help meet the needs of indigenous communities facing degraded standards of living from development of land and the introduction of industrialized food. 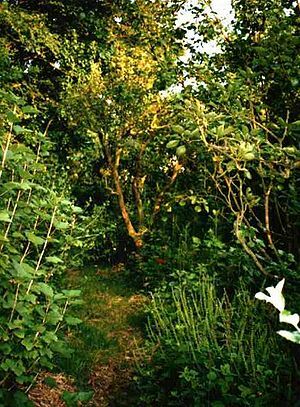 This article lists some examples of permaculture sites. Zimbabwe has 60 schools designed using permaculture, with a national team working within the schools' curriculum development unit. The UN High Commissioner for Refugees (UNHCR) has produced a report on using permaculture in refugee situations after successful use in camps in Southern Africa and Republic of Macedonia. The Biofarming approach applied in Ethiopia has very similar features and can be considered permaculture. It is mainly promoted by the non-governmental organisation BEA, based in Addis Ababa. A permaculture project has been developed in Jordan by the Permaculture Research Institute headquartered in Australia and run by Geoff Lawton. The project is strategically located in the desert land near the Dead Sea. The development of permaculture co-founder David Holmgren's home plot at Melliodora, Central Victoria, has been well documented at his website and published in e-book format . Designed from permaculture principles, Crystal Waters is a socially and environmentally responsible, economically viable rural subdivision north of Brisbane, Queensland. Crystal Waters was designed by Max Lindegger, Robert Tap, Barry Goodman and Geoff Young, and established in 1987. It received the 1996 World Habitat Award (assessed by Dr Wally N’Dow) for its "pioneering work in demonstrating new ways of low impact, sustainable living". Eighty-three freehold residential and two commercial lots occupy 20% of the 259ha (640 acre) property. The remaining 80% is the best land, and is owned in common. It can be licensed for sustainable agriculture, forestry, recreation and habitat projects. City Farm Perth is an example of community permaculture in an inner suburb of Perth, Western Australia. The farm was constructed on a brownfield site in 1994, and is a focal point for permaculture education, as well as community music and art. Tikopians practice an intensive permaculture system, similar in principle to forest gardening and the gardens of the New Guinea highlands. Their agricultural practices are strongly and consciously tied to the population density. For example, around 1600 AD, the people agreed to slaughter all pigs on the island and substitute fishing, because the pigs were taking too much food that could be eaten by people. The Indonesian Development of Education and Permaculture assisted in disaster relief in Aceh, Indonesia after the 2004 Tsunami . They have also developed Wastewater Gardens, a small-scale sewage treatment systems similar to Reedbeds. The Panya Project , located in Mae Taeng, Chiang Mai, Thailand, is a sustainable living project implementing permaculture principals and hosting workshops in English and Thai. In fall 2006, the project hosted a PDC taught by Geoff Lawton of the Permaculture Research Institute of Australia, and subsequently installed over 500 meters of swales and a 2 million liter dam. The Panya Project used permaculture to help regenerate what used to be a monocrop mango plantation, transforming it into what is called a "biodiverse food forest, organic farm and education center". The Panya Project also incorporates what they call "natural building" into their design, e.g., wattle, cob and adobe brick. Permaship  is an experimental and education center located on the southern slopes of Stara Planina, near the town of Shipka. Currently  it is the only permaculture project in existence in Eastern Europe. Two acres of land at Ayia Skepi Therapeutic Centre in Filani village, a drug rehabilitation centre about 25 km from Nicosia, are being developed by Emily Markides, Julia Yelton, Charles Yelton and the residents of the detoxification centre . Chickenshack Housing co-op, a fully mutual housing co-op established in 1995 using permaculture design principles. Based in rural North Wales, the community has 4 dwellings and 6 residents on a 5-acre (20,000 m2) site. Features include a biomass and solar district heating scheme, a half-acre forest garden and various wildlife conservation and habitat creation strategies. The community is very active in regional sustainability projects such as the Machynlleth Transition Towns initiative. It runs occasional courses in permaculture design and regularly receives visits from interested parties. Plants for a Future, a vegan-organic project based at Lostwithiel in Cornwall that is researching and trialing edible and otherwise useful plant crops for sustainable cultivation. Their online database features over 7,000 such species that can be grown within the UK . A collaborative version of the database is in development by the permaculture.info project. Prickly Nut Woods, a 10-acre (40,000 m2) woodland near Haslemere, Surrey that is managed by Ben Law. He uses a 'whole system' permacultural approach, using a wide variety of woodland products and documenting a complex web of relationships. He built a house almost entirely using products from the woodland, which was featured in Channel 4's Grand Designs TV series. Ragmans Lane, a 60-acre (240,000 m2) farm in the Forest of Dean in Gloucestershire . The RISC Roof Garden, on top of a development education centre in Reading city centre and inspired by Robert Hart's permaculture forest garden in Shropshire, is an excellent example of urban permaculture design. . It is used by schools, educators and designers as an educational resource for sustainable development and is a member of the National Gardens Scheme. The garden is composed of dense plantings of over 180 species of edible and medicinal plants and is fed by rainwater and composted waste from the centre. Tir Penrhos Isaf, near Dolgellau, developed by Chris and Lyn Dixon since 1986 . The Sussex Roots Society, a community permaculture garden initiated by Mischa Nowicki and Integralpermanence at Sussex University, collaborating with the student union as part of the countries first "Eco- University" initiative. Other projects tend to be more community oriented, particularly in urban areas. These include Naturewise, a north London based group that tends a number of forest gardens and allotments as well as running regular permaculture introductory and design courses; and Organiclea, a workers cooperative that is involved in developing local food-growing and distribution initiatives around the Walthamstow area of east London. The Transition Towns movement initiated in Totnes and Kinsale by Rob Hopkins is underpinned by permaculture design principles in its attempts to visualise sustainable communities beyond peak oil. The UK Permaculture Association publishes an extensive directory of other projects and example sites throughout the country . Also see the Permaculture Association of Teachers and Organizers on WiserEarth for a more-complete US Listing. The Northeastern Permaculture Network brings together enthusiasts in the northeastern United States and eastern Canada. Burlington Permaculture is an ad-hoc community group based out of Burlington Vermont. BTP unites neighbors to promote urban agriculture and reforestation, enhance neighborhoods, and strengthen the web of community resources as we look beyond sustainability towards a vibrant healthy relationship with our landscape. The group was founded by Michael Blazewicz of Round River Design and Mark Krawczyk of Rivenwood Crafts. Camp Epworth Permaculture Demonstration and Education Center is a collaborative project of Green Phoenix Permaculture, the United Methodist Church, and many permaculture designers & teachers including AppleSeed Permaculture, Sowing Solutions, and more. The Urban Permaculture Institute of the Southeast in Walterboro, South Carolina practices permaculture on a 1/2 acre lot in the middle of the city with chickens, fish, bees, food forestry, vermiculture, insect production, greywater systems, passive solar, mushroom production, rainwater catchment, floating hydroponics and partial hydroponic systems. Sweet Aspect Permaculture, the steward of one acre of land outside of Asheville, NC, is experimenting with permaculture principles, design, and implementation. Sweet Aspect focuses on small animal management, including lambs and chickens, gardens, orchards, edible forest management, shitake production, rainwater catchment, greywater systems, natural and green building, fermentation, herbal tinctures and plant medicines, humanure and other composting practices, and alternative fuel and energy harvesting. Knoxville Permaculture Guild, Knoxville, TN. Permaculture Research Institute for Cold Climate. The Round Mountain Institute in the Gunnison valley of Colorado is a nonprofit that is dedicated to sustainable agriculture high in the rocky mountains near the continental divide. Central Rocky Mountain Permaculture Institute. The Urban-Suburban Sustainability Initiative based in Belleville, Illinois is a local grassroots organization in the process of starting up. Its focus will be on permaculture, bioremedification, environmental education and Local Exchange Trading Systems. High Altitude Permaculture Institute is based in Ward, Colorado, which is west of Boulder. The Regenerative Design Institute (RDI) is a non-profit educational organization in Bolinas, California. The Urban Permaculture Guild implements and promotes elements of permaculture through educational workshops and projects in East Bay and San Francisco, CA. Indigenous Permaculture (IPP) revitalizes the relationship of communities to the earth, and operates as a collaborative of communities sharing information, resources, and tools. The Seattle Permaculture Guild is active in that city. The Portland Permaculture Guild (PPG) is very active in Portland, Oregon. There are many PC gardens in and around the Portland area. There are many fine teachers in Portland and in Oregon, including teachers OF PC teachers. Also, Toby Hemenway, noted Permaculture author and teacher, lives in the Portland area. Suburban Permaculture  The site in Eugene, Oregon is a notable example of transforming a suburban property. Grass to garden, rain water catchment, reclaiming automobile space, passive solar redesign, increasing residential density. The location has become a community learning resource and model for transforming suburbia. Alderleaf Wilderness College near Seattle, WA offers a ten month Wilderness Certification Program, in which permaculture is a core component of the curriculum along with wilderness survival skills, wild edible & medicinal plants, and other nature skills. Cuba has in the past 18 years transformed its food production using low-input, or organic agriculture and, to some degree, permaculture. Havana produces up to 50% of its food requirements within the city limits, all of it is organic and produced by people in their homes, gardens and in municipal spaces. Project Bona Fide is a 43-acre (170,000 m2) site on the twin volcano island of Ometepe, Nicaragua which has been in development for nearly a decade. Infrastructural systems contain natural buildings built with local materials, terraced and medicinal plant gardens, an extensive nursery, seed bank, developing fruit and nut orchards, food forests, native timber forestry, timber bamboo plantings, water-catchment, drip irrigation and ferrocement technologies, renewable energy systems, and composting toilets. Ostional Private WildLife Reserve ("O") is a 46-acre (190,000 m2) privately owned nature reserve on a historic site nicknamed La Colina ("the hill") in Rivas, Nicaragua. Project "O" has been in development for just a couple of years and is scheduled to open to the public in 2012, with plans to become a center for education and community development. Outreach efforts include a permaculture workshop. Finca El Zopilote is a farm/hostel operated since 2002 in Isla de Ometepe. IPCP - Instituto de Permacultura Cerrado-Pantanal (Permaculture Institute of Cerrado-Pantanal), Campo Grande, MS. Specializing in interactive teaching of Permaculture and direct work with Indigenous communities within the Cerrado biome. The Permaculture community in Chile is relatively new. Its development has been driven largely by a small group of dedicated Permacultors building a learning community. The community has rapidly expanded in the last two years following a tour by David Holmgren in 2007, the work of Eluwn the delivery of Permaculture Design Certificate courses, and the formation of the Instituto de Permcaultura en Chile. The broad network can be found at www.permacultura.cl where specific links can be found to the leading organisations. ^ Ragmanslane Farm - it all starts here folks! ^ Organiclea is a small food growing cooperative in the Lea Valley on London's edge, E4. ^ Portland Permaculture Guild Sustainable designs for local, regional, and personal needs.